Last week, I highlighted many African-derived words in the Gullah dialect that Dr. Lorenzo Turner identified in his book. Several of my Nigerian readers were intrigued by the retention of Fulfulde numerals (from one to 19) in Gullah, which Turner recorded near the town of Darien, in the state of Georgia, in the 1930s. Another surprise for me is the Gullah people’s retention of some uniquely African exclamatory expressions. For instance, Turner recorded the interjectory expression “kai!” among the Gullah. Like in many West African, particularly Nigerian, languages, “kai!” is used in Gullah to express great surprise. The exclamation “bismilai!” to express shock or great surprise also survives in Gullah—at least up to the time Turner observed and recorded the language in Georgia and South Carolina. It was most certainly bequeathed to them by their Senegambian Muslim ancestors. As any Muslim knows, Bismillah is the first phrase of the Qur’an, which means “in the name of Allah.” But it’s also often used as an exclamatory expression. 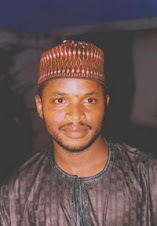 Contemporary (northern) Nigerian Muslims tend to prefer “A’uzu billahi!” which is the shortened form a’uzu billah min ash shaitan rajim (I seek protection from Allah against Satan), often said before bismillah. Or they may say “subhallah!” (Glory be to Allah). It is also worth noting that the ubiquitous “una” (plural form of you) in African-inflected English pidgins and creoles is also present in Gullah. It is derived from the Igbo “unu,” which is also the plural form of “you” in the language, the singular being “ya” or “gi.” While “una” is the preferred form of the pronoun in Gullah, other variants exist, such as “huna,” “wuna,” and “unu” (preserved from the original form in Igbo). In Gullah, “mi na una” means “me and you,” where “na” means “and,” as it does in Igbo. 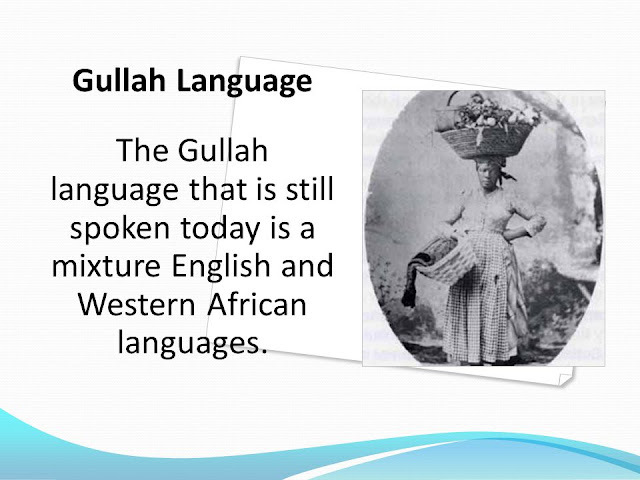 Turner also identified several fascinating syntactic similarities between Gullah and West African languages. For example, he said, “In a great many of the West African languages, as in Gullah, there is no distinction of voice” (209). He gave an example to illustrate this: “instead of saying He was beaten, the Gullah speaker says, dem bit am, ‘They beat him’.” That is exactly how it would be said in Nigerian (or West African) Pidgin English. “In Standard English, ‘they’ is the plural of ‘he,’ ‘she,’ and ‘it.’ In Nigerian English, however, ‘they’ can refer to a single person or entity. For instance, if a parent sends a child to call another child, the child could say something like, ‘Abdul, they are calling you,’ where ‘they’ … refers to the parent. When there is a power cut from the Power Holding Company of Nigeria…children routinely say ‘they have taken light,’ where ‘they’ refers to the electricity company. In Gullah, as in West African Pidgin English, “dem” is the lexical equivalent of the English “they,” and its use as a singular signifier even though it is lexically plural owes sociolinguistic debt to the structure of West African languages where “they” can signify "singularness." The person who composed the status update is obviously not a linguist. If he were, he would have been familiar with the fact that it isn’t only in Pidgin English that interrogative and declarative sentences have the same syntactic arrangement. He would have known that this is also true of many African-inflected English-based creoles in the historic Western black diaspora, and that this feature is derived from West African languages. Most Influential African Languages in Gullah? People who have been following my series on the Gullah have asked if I can give them a sense of which African languages have had the most influence on Gullah. That is a difficult question to answer, but I will give it a shot. According to Elizabeth Donnan’s Documents Illustrative of the History of the Slave Trade to America vol. 4, which was published in 1935, between 1716 and 1744, 51 percent of slaves brought to Charleston, South Carolina (from where they were later taken to Georgia) came from Angola (which includes present-day Angola and the Congo); 7.4 percent came from Senegambia; 4.7 percent came from the Bight of Biafra, which encompasses most of present-day (coastal) southern Nigeria; 2.8 percent came from the Gold Coast, which is now Ghana; 0.2 came percent from the Windward Coast, which is now Liberia and Cote d'Ivoire; and the geographic and ethnic origins of 33.9 percent are unknown, perhaps because they came from the Caribbean Islands. From 1749 to 1787, 25.2 percent of the slaves taken to the Sea Islands came from Senegambia; 16.7 percent came from Liberia and Cote d'Ivoire; 14.6 percent came from what is now Angola and Congo; 13.1 percent came from present-day Ghana; 6.6 percent came from Sierra Leone; 2.2 percent came from the Bight of Benin, in what is now Benin Republic and Togo; 0.8 percent came from the Bight of Biafra or southern Nigeria; and 20.7 percent came from the Caribbean Islands. From 1804 to 1807, 52 percent of the Africans who became Gullah came from Angola and the Congo; 17.9 percent from Liberia and Cote d'Ivoire; 11.4 percent from Ghana; 4.7 percent from Sierra Leone; 1.7 percent from Senegambia; 2.5 percent from (coastal) southern Nigeria; 1.6 percent from Madagascar and Mozambique; and 8.2 percent from the Caribbean Islands. What has become apparent to me from reading various books on the Gullah people is that they inherited various things from several different ancestors. Most of their quotidian cultural performances have heavy Sierra Leonean and Liberian imprints, to use the modern identifiers for their places of origin. In terms of lexical influences in their language, Mali, Senegal, Gambia (Mandingo, Fulani, Wolof, etc.) and Angola tend to predominate, although there are tinctures of lexical influences from almost all of the ethnicities from which they trace their ancestral provenance. In personal names, Yoruba is disproportionately dominant, especially given that slave records from the Port of Charleston in South Carolina show that less than 1 percent of the ancestors of the Gullah are Yoruba. Of the nearly 4,000 personal names Turner recorded, I identified 775 names that are unmistakably Yoruba, including names like Oduduwa (the mythological Yoruba progenitor), and even names of Yoruba sub-groups like Ijesa and Ogbomosho. Nonetheless, as the records I quoted above show, merely looking at the percentage distribution of Africans brought to the Sea Islands to determine the Nigerian origins of Gullah people may be misleading since a large number of their ancestors came to their present location by way of the Caribbean Islands. My sense is that the Nigerian (particularly Yoruba and Igbo) influence in Gullah culture and language emerged from their ancestors who came from the Caribbean Islands. Gullah, unfortunately, is dying in Georgia and South Carolina. Many young people no longer speak it, and those who speak it either consciously or involuntarily purge the African influences in it, making it sound increasingly close to mainstream American English. This process is called “decreolization.” So Gullah is on its way to becoming what linguists call a “vestigial post-creole,” that is, a former lingual admixture of indigenous languages and a foreign (often European) language that has now taken both the structure and vocabulary of the foreign language and dismantled all or most elements of the indigenous languages that constituted the substrate of the admixture.